I set up a work station next to the garage and hammered away. After 30 minutes I filled a cup. She inspected my work and asked for another cup. An additional thirty minutes passed with a new request for more nuts. Soon I had bowls full of nuts. Altogether my project took over an hour. I missed an NFL game on TV. After sleeping off Thanksgiving indigestion it occurs to me that maybe she wanted me out of the house? The walnut pie was PRIMO by the way. 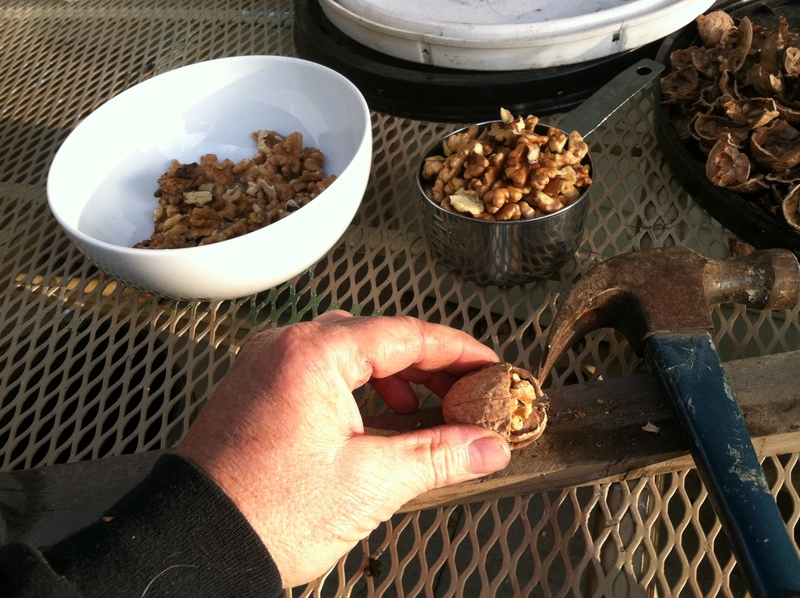 A guy with a hammer and walnuts is easily entertained…. READERS: Happy Thanksgiving. I blew past my 31 inch waistband in no time. Visit my Etc.Guy Facebook page too.